What do you do when you’re already at “tilt” and you’re handed a few more servings of “yikes”? Know it or not… we all have a boiling point. I have a comfort level that’s somewhere on the rainbow spectrum of chaos between “Code Green” and a bright “Code Yellow.” I can handle a light orange for a while, but no one is comfortable when I’m at Code RED. Chaos tolerance and mitigation is something I’ve spent a lot of time researching and respecting. (Be prepared to read a LOT more on the subject.) Normally, my house runs at a bubbly level of chaos, but not over-the-top crazy. Chaos isn’t all bad. Some chaos keeps things lively, keeps us learning. We just need to be aware of our limits, triggers, and mechanisms to get back to a level that works for us. The scene. I just published a coaching workbook for parents. We’re launching the Julz of Life Membership site this week. (My husband is in on it with me. He is my staff.) We virtually school our kids, so they are here with us, and we serve as their “learning coaches.” My husband plows snow on occasion. With the re-launch of Julz of Life, we’ve been working 16 hour days fairly non-stop since January began. Luckily, we work from home, so parenting and a smidge of self-care gets sprinkled in there throughout the day. We know that this is temporary, so we can choose a “new normal” for a season. I handle the laundry, hub handles most of the dinners (he rocks! ), and we share the dishes and fire stoking. This has kept our noses slightly above crazy waters and everyone is fed, clothed, and not freezing. Not staying up past 1 a.m.
Last night, we were handed a double-whammy. My youngest had 4 new “portfolios” (read “big, bad projects”) show up on her school planner that added to 2 already there. Tears. Her overwhelm was also causing physical distress manifesting itself into snot, so she requested to cancel her morning activity (request granted), and I put her to bed early. And then it snowed. For most things, my hub and I tag team. When I freak out, he unruffles me and then vice-versa. This was one of those moments when we were both hit at the same time. Already, each of us had 300 “overdues” on our lists with glitches and rabbit holes galore, and stopping the day to flip into “teach mode” wasn’t on either of our radars. And, although snow was on the literal radar, it’s blown over the last 4 times it was predicted. 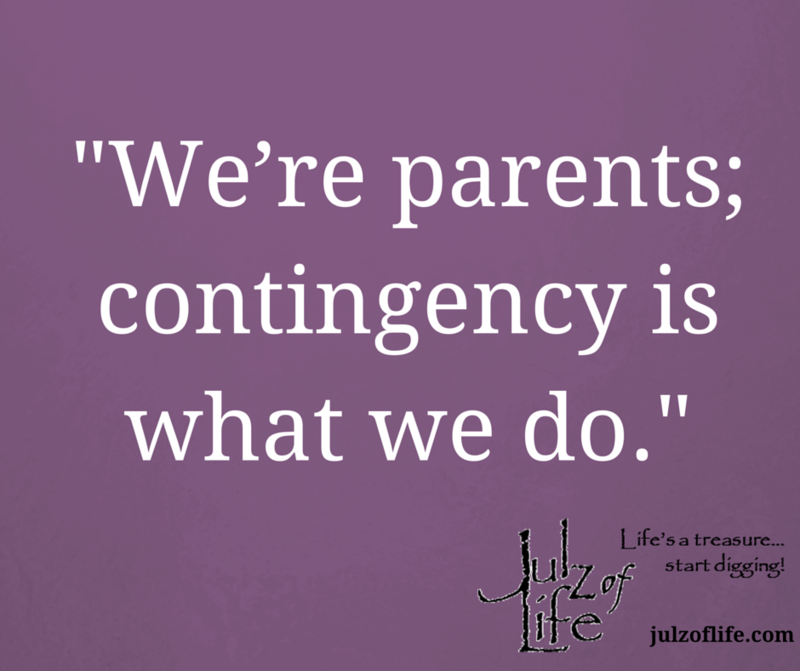 We’re parents; contingency is what we do. After several bouts of each of us slightly freaking out (then noticing, apologizing, and unruffling back to chill), we came up with our contingency. Me: create a digestible plan/timeline with our daughter and discuss where she can go for resources. Him: work on ads until the snow stops and he has to go push it around. Added chaos, whammies of all sorts, have their way of putting things in perspective. For us, parenting is always #1 even when it’s waiting in the wings for a moment. We know we’re blessed to be healthy, and have capable, loving kids who step in when needed. We know this is a tiny blip, one that may not even register as “chaos” by others’ definition (and for some, just the thought of being an entrepreneur or a parent might send them over the edge), but it’s our current chaos. We adjust accordingly. You’ll be hearing more about chaos tolerance as my new book rolls out. For now, I’ll feed you glimpses as they appear in real time. Julie Ford is a certified life coach, author, speaker, facilitator and trainer. She helps organizations support their high performers through parenting transitions. With one-on-one and group coaching, she helps her clients to define what matters most in their lives, and to realize what is and isn’t working. Collaboratively, they move through a customized plan to find more joy and less chaos in the everyday.